Physicians rarely promote the curative properties of H2O, but Dr. Batmanghelidj, M.D. has studied water's effect on the human body and has found it to be one of the best pain relievers and preventative therapies in existence. 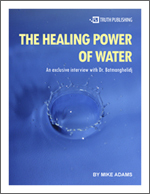 I was one of the last people to interview the late Dr. Batmanghelidj, and I listened in awe as he shared his research and stories about "The Healing Power of Water." • Why most people are chronically dehydrated and suffer from symptoms of dehydration that are labeled "diseases"